To complete our Comprehensive Eye exam, our Ophthalmologists will thoroughly examine the back of the eye (called the fundus) using Ophthalmoscopy. 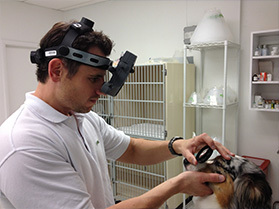 The fundus consists of the retina, optic disc, blood vessels and a tapetum if the pet has one. Examination of these structures is integral to the diagnosis and treatment of diseases such a glaucoma, retinal detachment, retinal inflammation, retinal degeneration, high blood pressure, diseases of the blood etc.